These three novels are set in the 35th century AD, in the Empire of Nashua1. While it is clear that the heaviness of the imperial hand varies considerably from place to place and from person to person, for the people the plot focuses on the Empire is a pleasant enough realm, one that has niches for aristocrats and con artists, for enthusiastic functionaries, competent and otherwise, scholars and yagoots. In a later book, the Empire is explained as a con job the rest of the civilized worlds played on Nashua to get it to accept the burden of administrating the interstellar community. Whether this is true or not, Nashua takes its responsibilities seriously, with mixed results. 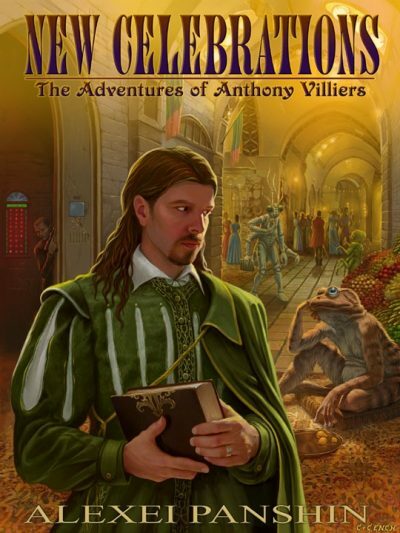 Anthony Villiers is well born, educated, as charming as he needs to be and a second son who is sufficiently disappointing to his family that it is worth their while to pay him to stay far away; his irregular remittances often arrive with the family itinerary, so embarrassing encounters may be avoided. This allows him considerable freedom to wander the Empire as it pleases him. Villiers is accompanied by Torve the Trog, who is not one of the fifty-odd Trogs legally permitted to journey away from the two Trog home worlds; happily Torve is adept in the arts of obfuscating eccentricity and while customs officials often take note of him they are never quite able to follow through on their curiosity. Probably Torve’s purpose is not sinister. Villiers’ adventures are narrated by an amiable figure whose identity is never clear, although he seems harmless enough. Villiers finds himself in an awkward position because he and his remittance have taken all too different routes through the Empire, leaving him unable to pay his hotel bill on the deep space way station known as Star Well (which, come to thing of it, isn’t a well and doesn’t have a star). Rather than admit this, Villiers prefers to act as though money isn’t an issue; unfortunately this leaves his hosts Godwin and Shirabi free to come up with some other explanation for Villiers’ reluctance to pay his bill and leave what is after all a galactic backwater. The explanation they come up with is that Villiers knows all too much about the extremely illegal enterprises Godwin and Shirabi are running out of Star Well. Complications include the arrival of genuine imperial agents, competent and otherwise, the fact that Godwin and Shirabi’s bosses went out of their way to put Star Well in charge of two administrators who would find each other abrasive and the arrival of a bevy of schoolgirls, one of whom is Louisa Parini, familiar to Villiers and from an interesting family whose history is not often bounded by mere factuality, and her close friend Alice Tutuila, whose romantic dreams are in no way bounded by reality. Villiers and his companion Torve meet Fred, an old friend of Villiers, and head off for what should have been a quiet camping holiday. Torve attracts the attention of some young people, yagoots and less useless types, and drags them along in his wake. Villiers manages to enrage Admiral Beagle, who as a retiree has all the time he needs to pursue a vendetta against Villiers. Fred finds himself wrestling with disturbing feelings about David, a young man who has attached himself to the party. While all this is going on, Villiers is stalked by a variety of people, one of who is the assassin responsible for Villiers’ missing fingertip. By the way, Villiers is missing the tip of one finger. Also featured is God, who expresses disappointment in Villiers. Well, join the line. On the eve of Xochitl Sodality Night, Villiers and Torve arrive on Delbalso, Villiers in search of papers and other useful things from the Parini family and Torve in search of whatever it is a Trog wants. Delbalso is caught up in the turmoil of the Winter-Summer Laws, a general solution to a specific problem; Villiers and his friend help catalyze a solution to the conflict dividing Delbaslo. I am aware that the author might read this which would be more inhibiting if not for Villiers’ reading of the Mrs. Waldo Wintergood books. I trust I need not say more. First the negative: I know these were written in the 1960s but while Louisa and Alice have their moments, I expect the treatment of women by the author of Rite of Passage to be better than it was in these three books. For the most part, most of the significant figures are male and the women tend to be treated in a very male-gazey way. As well, perhaps one of the villains in Star Well needed not be quite so hook-nosed and swarthy. While Villiers is perfectly able to be a man of action when he needs to be, he is the sort of person who prefers a well-timed raised eyebrow accompanied by an incisive bon mot, a quiet conversation over a duel. I think Villiers would approve of the sentiment in “Down these mean streets a man must go who is not himself mean, who is neither tarnished nor afraid,” but he’d have an issue with “He talks as the man of his age talks, that is, with rude wit, […]”; Villiers is a gentleman and he speaks like one. I found myself wondering if Villiers’ amused detachment reflects his experience and developing maturity or if it was the result of crippling post-traumatic stress disorder. For books where young girls are in serious danger of being dismembered for the thumb trade and where someone off-stage has been trying to kill Villiers for years, these are surprisingly gentle comedies. I expect in someone else’s hands, Alice would come to a much darker end and Villiers wouldn’t have politely declined Louisa’s ambitious offer. The antagonists in this tend to be presented in a more sympathetic light than is the custom in much SF. Even Godwin and Shirabi have moments where a reader feels sorry for them despite Godwin being a cold blooded killer and Shirabi the sort of person who would terrorize helpless schoolgirls out of pique. While nobody quite like Bertie Wooster appears in this series, I expect Villiers knows the type. Yagoots in particular seem likely to nick a bobby’s helmet. People should go into this expecting pacing more like that of Yokohama Kaidashi Kikou than “Trouble is My Business”. Panshin is perfectly happy to stretch explanations out over the entire series, to leave some questions unanswered, to leave it up to readers to work out what event defines Year One of the common reckoning and to drop illuminating details about supporting characters into books where those characters do not appear. Generally the third installment is held to be the least, while people disagree over which of the first two are better. I tend to think the first is better than the second but I probably won’t use the cut direct on anyone who prefers the second; people should be free to make mistakes. Happily, you don’t have to choose which one to buy because they are all available in one handy omnibus which is available from major retailers. Those of you familiar with Panshin’s Rite of Passage might be interested to know that if I’ve read “Sky Blue” correctly and have not overlooked important details, the Empire is in Rite’s future, which means the murderous thugs of the Ships were eventually overthrown. Hurrah for progress! No offense to Mia but her friends and family are genocidal monsters and the universe is better for their absence.